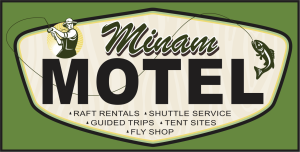 Since my wife, Lottie, and I bought the Minam raft rental business it has really opened up a lot of new outdoor opportunities for us as a family. It is difficult to do backpacking trips with kids. It can be done and we do them, but it is difficult at times. 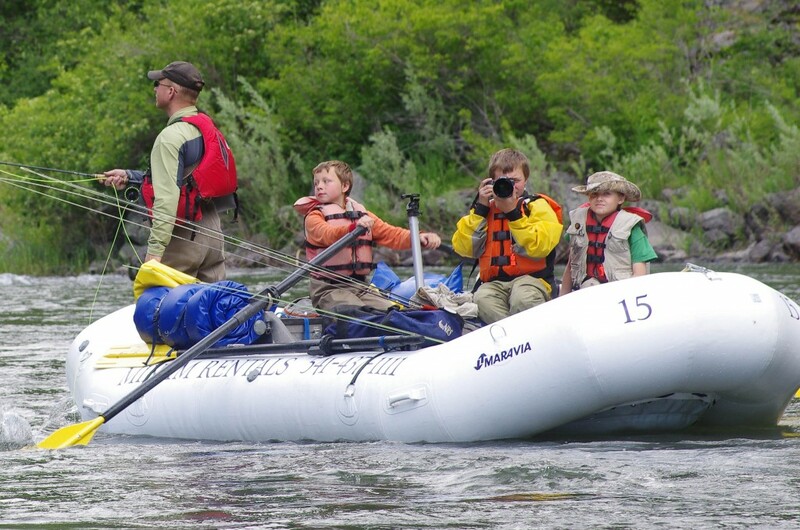 Rafting the Grande Ronde, however, is much easier to do with a family. No need to worry about how much gear because rafts can haul way more gear then you want to mess around with. At least, more gear than I want to mess around with. I am a stepdad and although we have the boys throughout each week, we only get the boys one weekend per month. Being self-employed often means that work does not stop at the end of the day and may go well into the evening. As a result, the weekdays are often too busy and it is work, work, work with no time for anything else. When the boys are home for the weekend I do my best to do something fun since most weekdays are filled with work. Sometimes we go on hiking trips, sometimes just day trips to different locations to fish, and since we now have a fleet of rafts available, we can now go on a lot of rafting trips. In fact, rafting the Wallowa River and Grande Ronde River has become somewhat of a de facto option when the weather is too crummy to go hiking, other rivers are running too high or dirty to fish easily from the bank, or I just can’t think of anything that sounds better. On our last trip as I was unloading rafts and making camp, making dinner, cleaning dinner up, breaking camp, loading rafts, etc. I decided it was time for the boys to start rowing more. The boys do help make and break camp, but during a lot of the work they get to fish so I told them, “OK. I have been doing all the work, it is time for you guys to take turns rowing so I have a chance to fish.” Now, they enjoy rowing. So it isn’t like it is punishment or anything. Every trip we have made, they have done some of the rowing over the past two years and have become fairly good little rowers. They usually only row for a mile or two though. When I told them it was their turn to row, we still had 20 miles of river to cover. I climbed into the back of the boat and said “Don’t bother me, I am fishing. You know the river and you know how to row so now it is your turn to be the guide and I will fish.” They gave me the sheepish grins and giggles of young kids and we headed down the river. I complained here and there to help them improve their guiding skills, “The best fishing is over there,” and I pointed “why aren’t we over there? . . . You guys are making me work too hard at casting, the bank is too far away. Can’t you get a little closer to the bank?” It was high water still after all and if the fish didn’t have a nice big boulder to hide in front of or behind midstream they were going to be hugging the banks to get away from the current and pick up migrating stonefly nymphs that were getting ready to hatch in huge numbers. The boys did an excellent job of rowing. As we approached Martin’s Misery rapids I took a break from fishing and did the rowing just in case. Martin’s Misery is pretty easy at high water and they could have handled it easily. The next twenty miles down the river they took turns rowing when one of the others would get tired. Sometimes they would fish out of the front of the boat as well. I begrudgingly said yes when they asked if they could use my expensive camera to take pictures. It isn’t that I don’t want them to learn how to use a DSLR camera, but it cost a lot of money and we were in the middle of a river after all and they are kids who tend to make mistakes not knowing better sometimes. We first went over safety precautions, “Put the strap around your neck first thing so if you accidentally drop it, it doesn’t get wet and stay in the middle of the raft. Do not go near the edge with the camera.” But in my mind I went through them dropping my camera in the river and practiced in my mind not getting too mad just in case it actually happened. The last twenty miles with them navigating the river went exceptionally well. I did not holler out instructions and let them go. They knew how to do it, I just had to let them do it. The only time I became worried a little bit was when Brenden was rowing me fairly close to the bank for easy casting when I looked downstream to see a sweeper. Brenden had also been watching me and not the sweeper so it caught everyone a little off guard. I told him to row hard and he did. His brothers decided to be safe and grabbed an oar each and helped give the oars some extra force and between the three of them we got out past the sweeper with speed. Excellent work boys. Now I just need to teach them to do all the cooking and I will have it made. Thanks to Jeff Northam for the pictures of the boys and I rafting. 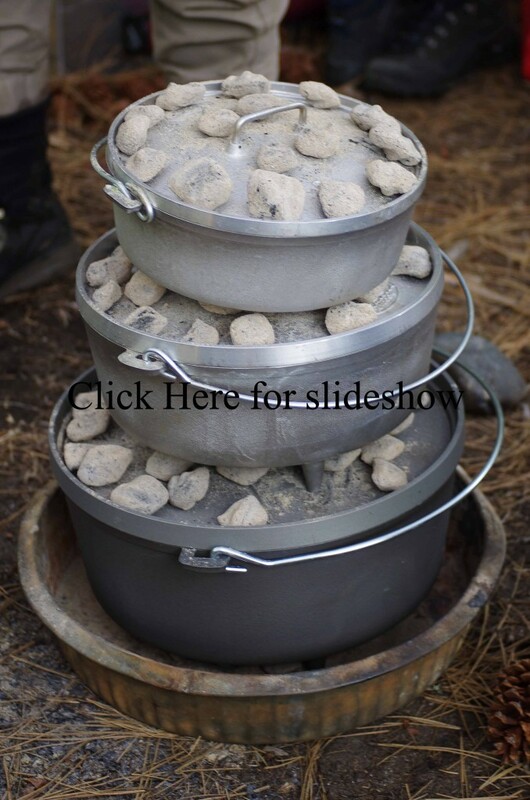 Click the picture below for more pictures from the weekend. 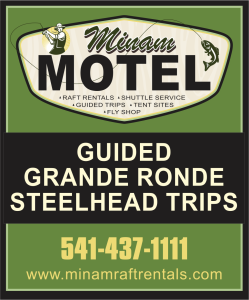 We are now offering guided trips on the Grande Ronde, please visit our guided trips page for more information. This entry was posted in Grande Ronde River, Wallowa River. Bookmark the permalink.